[167 Pages Report] The automotive transmission market is estimated to be worth USD 147.41 Billion in 2016 and is projected to grow at a CAGR of 5.89% between 2016 to 2021. The study has considered the base year as 2015, which estimates the market size of automotive transmission market and the forecast period is 2016 to 2021. The report analyzes and forecasts the market size, in terms of volume (thousand units) and value (USD million), for the automotive transmission market. The report segments the automotive transmission market and forecasts its size, by volume and value, based on region, product type, drive type, and applications. The report provides a detailed analysis of various forces acting in the market (drivers, restraints, opportunities, and challenges). The report covers key players and comprehensively analyzes their market shares and core competencies. It also tracks and analyzes competitive developments such as joint ventures, mergers & acquisitions, new product launches, expansions, and other activities carried out by key industry participants. In the research methodology, various secondary sources has been used such as Society of Indian Automobile Manufacturers (SIAM), China Association of Automobile Manufacturers (CAAM), Environmental Protection Agency (EPA), International Council on Clean Transportation (ICCT) and European Automobile Manufacturers Association (EAMA). Interviews have been conducted with experts from related industries and suppliers to understand the future trends of the automotive transmission market. The top down approach has been used to estimate and validate the size of the global market. The market size, by volume, is derived by identifying the region-wise production volumes and analyzing the demand trends. The market size, by value, is derived by multiplying the average selling price of automotive transmission by the number of units. The figure given below illustrates the break-up of the profile of industry experts participated in primary discussions. 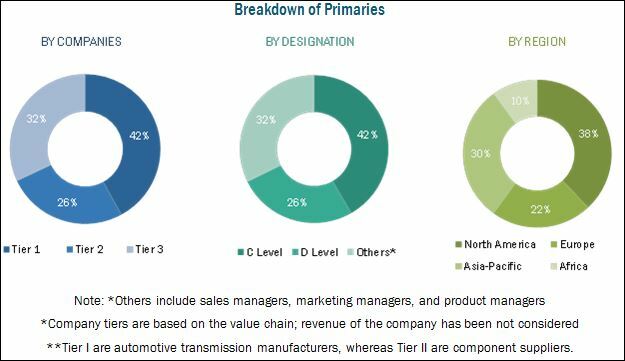 The automotive transmission market ecosystem consists of various automotive transmission manufacturers such as Aisen Seiki Company ltd. (Japan), ZF TRW (Germany), Borgwarner Inc. (U.S.), Continental AG (Germany), Magna International Inc. (Getrag) (U.S.) and Eaton Plc. (Republic of Ireland) among others and research institutes such as Society of Indian Automobile Manufacturers (SIAM), China Association of Automobile Manufacturers (CAAM), Environmental Protection Agency (EPA), International Council on Clean Transportation (ICCT) and European Automobile Manufacturers Association (EAMA), among others. The automotive transmission market is projected to grow at a CAGR of 5.89% from 2016 to 2021, to reach a market size of USD 196.20 Billion. The major drivers of this market are the enhanced driving experience in terms of smooth gear shifting and improved acceleration, has contributed to a rise in vehicle production across developing nations like China, India and Brazil. The passenger car segment accounted for the largest share of the global transmission market, by vehicle type. This is followed by light commercial vehicles and heavy commercial vehicles. In passenger car segment, the transmission system has been evolving from simple four speed automatic transmission to more sophisticated eight to nine speed automatic transmissions to offer comfort and fuel efficiency to the consumer. In case of manual transmission market, the 5 to 6 speed gear segment leads the way, owing to its increased usage in passenger cars and LCVs. OEMs are adopting gearboxes with higher number of gears that offer better fuel efficiency as compared with a six-speed transmission. The automatic transmission (AT) market, in terms of value, is estimated to grow at the highest CAGR during the forecast period. The transmission market for two wheelers will see a steady growth as the demand for two wheelers is on the rise given the fuel efficiency and ease of commuting offered by two wheelers. In developed regions such as Europe and North America, scooters and motorcycles are mainly used for recreational purposes they are cheap to buy, easy to operate and convenient to park. The favorable macroeconomic factors in the Asia-Pacific, like cheap labor, government incentives for manufacturing industry and large local market have ensured that this region accounts for the largest share of the global transmission market. It consists of countries such as China, India, Japan, and South Korea where a majority of the automotive production is concentrated. Asia-Pacific is estimated to be followed by Europe where manual transmission is preferred over automatic transmission. The latest transmission systems, such as DCT and CVT integrated in the vehicles by the OEMs have a higher cost of installation as compared to conventional transmission systems. These systems are yet to reach the mass-market passenger car segment across the world. The high cost of transmission systems is one of the major constraints for the manufacturers to enter the Asia-Pacific market, a major car producing region. 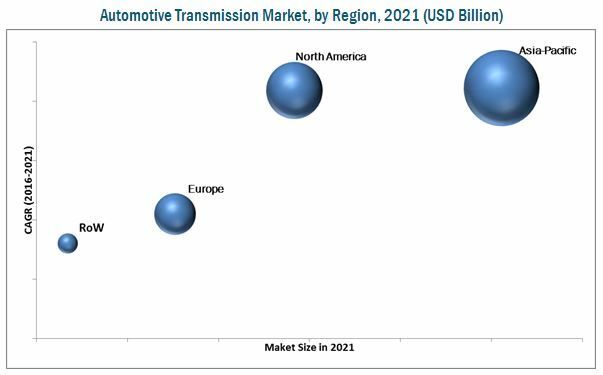 The global transmission market is dominated by many international as well as local players some of them being Aisin Seiki Co. (Japan), ZF Friedrichshafen AG (Germany), Getrag Corporate Group (Germany), Jatco Ltd. (Japan), and Magna Powertrain (U.S.). 14.4 Aisin Seiki Co. Ltd. Figure 62 SWOT Analysis : Aisin Seiki Co.Ltd. Figure 64 SWOT Analysis: Eaton Corporation PLC.